Four star performance in 2001 and 2002 NCAP crash safety tests and did particularly well in side impact test. 20-10-2013: Report of 2.0 TDCI 130 estate running to 215,000 miles with no trouble except new alternator and new exhaust back box. 2-1-2012: While dual mass flywheels can fail a lot earlier, mileages of 180k to 200k are not uncommon from dual mass flywheels. A 2004 Mondeo 2.0 TDCI 115 LX Estate currently holds the BCA mileage record at 534,491 miles, selling at BCA Enfield in Spetember 2009 for £825. 18-12-2018: Report of 2001 Ford Mondeo reaching 240,000 miles with very little trouble: Still on original clutch and exhaust system. Criticised for "unstable body structure" in 2001 NCAP test, despite four star score. Still seems to lack space for oddments inside cockpit. Reports of poor 35mpg economy from stop-gap 2.0 litre TDDI engine. 2.0 TDDI diesel engine also prone to flat spots and surging. On early LX and Zetecs the bottom of the seat is not very friendly to the coccyx. Also uncomfortable for heavier drivers because the plastic pins holding the molded padding in place can actually protrude through to the seat face. Later models much improved. Possible security issue in that access can be gained via passenger door when car is locked and immobilised. An engine rattle from 2000-2003 1.8i and 2.0i petrol engines might indicate wearing of the shaft of the injection air inlet manifold flaps. If the shaft breaks and the flaps come off they are then ingested by the engine, wrecking it. This was common. Also affects 1.8i engines. It was was rectified from 2003 by an improved inlet manifold design and in surviving cars the manifold will have been replaced by the newer design or the flaps will have been removed. Two reports of timing chain tensioner rattles on 2001MY 2.0 litre petrol engines, fixed under warranty. Several complaints of wind noise from front and rear door seals. Reports in 2008 of water leaks through lower front door seals. TDCi 130 engine may suffer from starting problems and uneven idling, may misfire between 1800 and 2000rpm, may sometimes cut out and may not be particularly economical with 42.5 mpg fairly typical. Partially cured by a an ECU software download, but head and injectors have also been modified on later cars. Reports of the TDCi smoking and of high oil consumption, which may be turbo oil seals. Reports of problems with camshaft position sensors of TDCi 130. Spate of clutch and dual-mass flywheel failures on 2003 built 2004 model year TDCi. Starting problems with diesel may be due to impending clutch failure. Iron filings from failing dual mass flywheels can get into the starter motor and cause starting problems. TDCi injectors seem to be very fuel sensitive. Many have needed to be replaced after 3-4 years and circa 60,000 miles. Report of turbo oil-seal failure in 2.2 TDCi turbo caused engine to run on its sump oil and self-destruct. Bill for replacement engine, turbo, catalytic converter, exceeded £7000. By early 2010, diesel pump failures also damaging the injectors were on the increase for both the 2.0 and 2.2 litre diesels. When replacing injectors, the new improved Delphi injectors are smaller than the originals and require a different seal. Use of original type of seal will result in fuel leaks. Diff problem starting to crop up on TDCi 130 6-speed from around 3 years old. Reports of failures of fuel tank lifter pumps leading to fuel delivery problems in 2.0 petrol models. Check inside edges of the bottoms of all doors of 2000 - 2003 cars for paint lifting and corrosion because the wax sealing between the door frame and skin can fail. Check for corroded rear brake pipes where they pass over the fuel tank (an MoT failure point). Check rear suspension bushes which can become loose in the attachment points (an MoT failure point) and used to require a new subframe costing £300 - £500 to replace. Ford now has a procedure that removes the need for a new subframe involving a new type of bush, a special tool (part number is 205-047-07) and Loctite 270 superglue (part number 1128-392). Unfortunately the tool and glue have been in short supply. The solution will not work if the subframe has corroded around the attachment points. Look for rust around chrome number plate light cover on Ghia estates. Undertray of ST very difficult to remove to get to engine sump plug, then very difficult to put back. 16 fasteners and a two man job. Reports of second gear band breaking up in 4-speed autobox, contaminating the ATF and requiring the box to be rebuilt. These boxes tend to have a life of 60k - 90k. JATCO advises owners of later 5-speed autoboxes not to carry out transmission fluid changes themselves because it's difficult to ensure the correct amount is added (the gearbox needs to be run to a specific temperature). Rear tracking is adjustable for toe in / toe out, but cannot be set with some types of alloy wheel because they do not have continuous rims and confuse the laser. Too much toe in will make the steering very light. Too much toe out will lead to severe tyre inner shoulder wear. Flexible front brake hoses vulnerable to chafing when not secured properly, and this can cause total brake failure if ruptured. One case of rust-through of water jacket of 2.0i petrol engine. On pre-2003 cars an a/c hose can chafe on the vertical joint of two flanges behind the front bumper and eventually sever, losing the refrigerant. Replacements are £80 but are modified so they do not chafe on the flange. Engine surging of 2.0 litre petrol can be cured by a new idle control valve. Quickclear screens tend to fail after 9 years or so. Problem with rear hatchback lock causes by cold and bad weather in the switch itself cured by a new switch at £25 from Ford. On 2.5 and 3.0 V6, a rumble from the front may mean that the bottom crank pulley damper assembly 4659709 is starting to separate around the rubber insert in the middle of the flat dinner plate sized wheel. Costs £83.23 + vat. Pulley Assy £25.47 +vat and the V-Belt £17.86+vat Total Labour £82.00. Separation is usuallly more marked on the inside than the side one can observe. If it fails completely then engine is written off. 21-9-2011: By September 2011, TDCi seemed to be suffering from a lot of problems with their Delphi injectors. Some blame increased proportion of biodiesel. Others blame lack of lubricity in some fuels. 28-9-2011: Quite a few reports of long lists of expensive repairs needed to 2.0 TDCi. Turbo, followed by rear springs, followed by injection pump and injectors. Cost more than the car is worth. 7-12-2011: 1.8i and 2.0i petrol engines have dual mass flywheels and these can eventually fail, though not usually until 100k + miles and/or 6 - 8 years. Some last 200,000 miles. 7-1-2012: Tip if 2.0 or 2.2 TDCi will start, but refuses to tick over in cold weather. Probably caused by engine fuel pump valve sensor sticking. Withdraw dip stick, remove oil filler cap, and remove plastic engine cover which is only held by simple rubber grommets. The unit is located beside the radiator just behind the offside headlamp. A slight tap should release it. 7-8-2012: On electric seats the height adjusting system fails because the gearwheel is plastic working off a Archimedes type screw and eventually the teeth strip. Apparently, more robust brass replacement gearwheels can be obtained from Germany. 1-9-2016: As well as due to failed swirl flap motors, misfire may also be due to the coil pack, which, despite being 'solid state', can begin to break down internally, giving rise to misfiring. Automatics had an additional ignition module that might need to be taken into consideration in diagnostics. 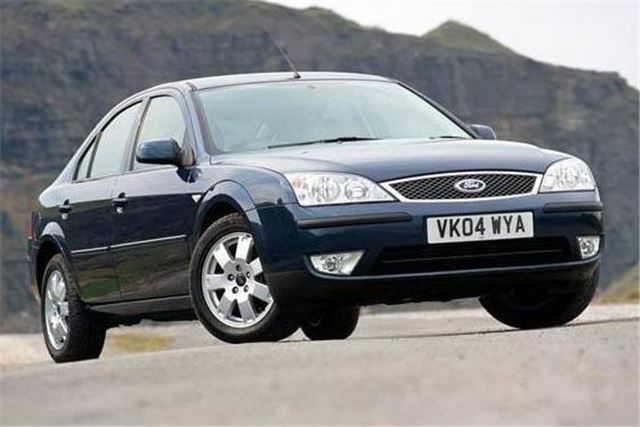 29-12-2000: 2500 2001 model year Mondeo recalled to have side airbag trigger electronics replaced. 16-7-2001: Warning sent out to owners about correct operation of handbrake: press brake pedal firmly; while brake pedal pressed, pull handbrake lever up to its fullest extent keeping finger off the ratchet button. Always park an automatic in 'P'. 21-8-2001: 5,595 2001 model year Mondeo built October 2000 to July 2001 fitted with cruise control recalled because water ingress can corrode the electrics leading to failure to switch off. 20-4-2002: 60,000 Mondeo built January to November 2001 recalled for parking brake ratchet to be adjusted. 31-10-2002: Mondeo 2001 with 2.0L DuraTorq-TDCi engine built from 10.2001 (build code 1K), Focus with 1.8L DuraTorq-TDCi engine built from 05.2001 (build code 1B. Engine running erratically or does not start. Common cause is that the fuel pump is unable to deliver the required fuel rail pressure due to wear of the cam, rollers and shoes. The damage is caused by insufficient bedding of the rollers during early life. This also creates metallic particles which can enter the high pressure fuel system and lead to injector failure. To rectify this concern, a revised fuel pump, new injectors and associated parts should be installed. If this concern is present, it will generally be indicated by a flashing glow plug indicator showing that a fault has been detected. This bulletin supersedes TSB 63/2002 dated 08.08.2002, which should either be destroyed or clearly marked to show it is no longer valid (e.g. with a line across the page). Additions have been made to the Parts Required and Labour Times. The Service Instruction has been ammended. 3-2-2003: Power steering pressure hose may chafe on engine inlet manifold, ultimately resulting in oil leak and loss of assistance to steering. Fit latest production level, revised routing PAS pressure hose. TECHNICAL SERVICE BULLETIN No.37/2003 Car and Light/Medium Commercial 31.03.2003 Section: 303-04E Model: Mondeo 2001 (Engine: 2.0L DuraTorq-TDCi) Markets: All. Subject: Engine cuts out. Summary: Should a customer express concern that the engine is cutting out, the probable cause is a failed connection of the fuel pressure sensor electrical connector. To rectify this concern, a modified fuel pressure sensor electrical connector should be installed. Note: To carry out the service instruction, it will be necessary to splice the new fuel pressure sensor electrical connector into the engine wiring harness. 13-10-2007: Voluntary Recall letter to owners of TDDI and TDCI to replace faulty dual mass flywheels.